As I sit hear writing this, my daughter is wiping her tears and snot all over my legs. She's upset that I won't hold her, and she was upset that I stopped her from self-injuring when I refused to pick her up. So she's crying on my legs. I'm happy to caress her back and wipe her tears and be her "Kleenex". It's the life of mom. Any mom, really. 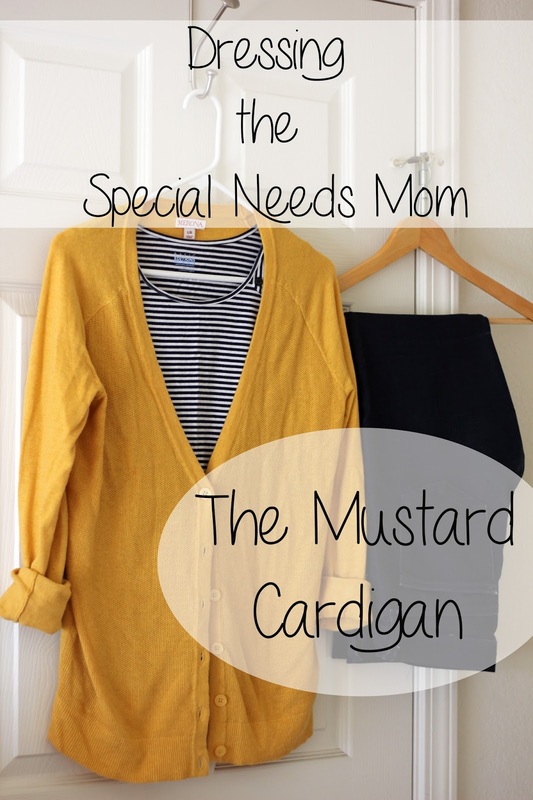 Special needs kids can bring in an extended period of messiness to our life that most parents will see their kids out-grow. We may see extended periods of diaper changing, cleaning up reflux, experience a food shower at just about every mealtime. This is life, so why shouldn't we just live in our sweats or grungy clothes, "because that's where I'll end up anyway"? Because, we need to have some self worth. It's part of self-care. Caregivers need it. Even if we're just in our nice clothes at the beginning of the day for a very short time to drop the kids at school and go back home to tend to therapy or what-have-you. You'll be amazed how you feel about yourself, and how your self-worth and self esteem will grow if you take these extra minutes in the morning. It's taken me time to grow into this mind-set. Trust me, I was in the yoga pants and sweats for years before I figured out that wasn't who I wanted to be, and that's not who I wanted to represent my children as. So where do you start? 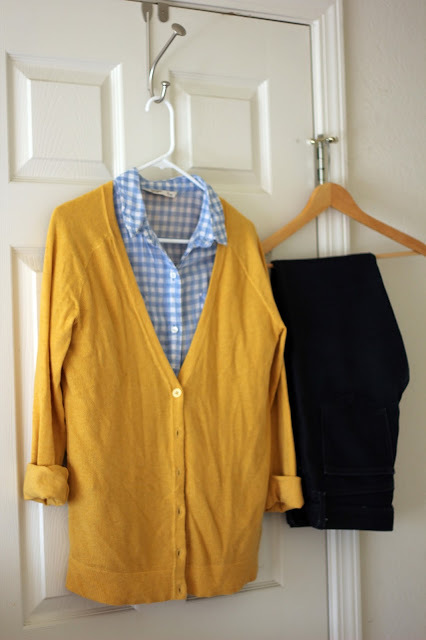 You don't have to go out and buy a whole new wardrobe. If you have only grungies and yoga pants, you can start with one piece at a time. Or if you're like me, head to the thrift store and spend $20 and get a few pieces that you can wear interchangeably. Capsule wardrobes are pretty popular now and you can find a ton of ideas on Pinterest. My one piece of advice, above all else would be, invest in a really nice pair of jeans. Don't wear them everyday. Yes, buy them to fit and be comfy, but keep them to look nice in. A nice pair of jeans can be dressed up or down, and even worn as evening attire (if you're lucky enough to get an evening out!) with some cute heals or sparkly flats. This Christmas I was blessed with a gift card to Target. (I'm thrilled easily.) I went straight for the cardigan section. I was hoping to find a red one, but I was just as happy to find a Mustard cardigan! 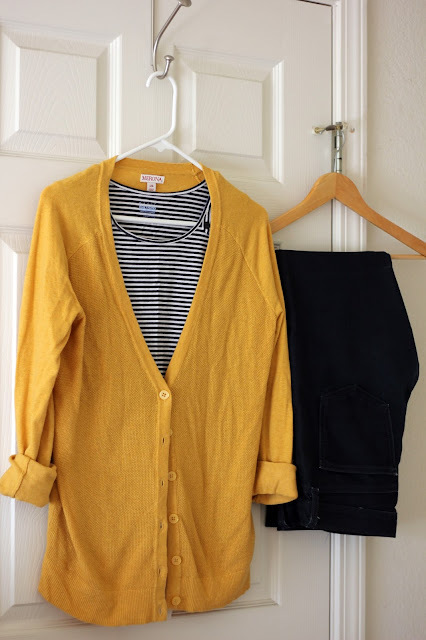 With a little help from the interweb, and a color palette, I mixed and matched some of what I already had in my closet to come up with a few different ways I can wear my new Cardigan. Mustard with Black or Navy Stripes, and a pair of jeans. 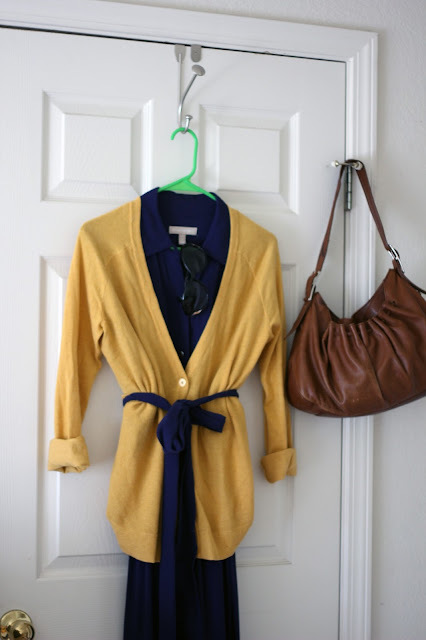 Cute and classy. Can be worn with a pair of tenni's or some flats. Looks cute and pulled together. A white tee. You can wear a white tee with anything really. 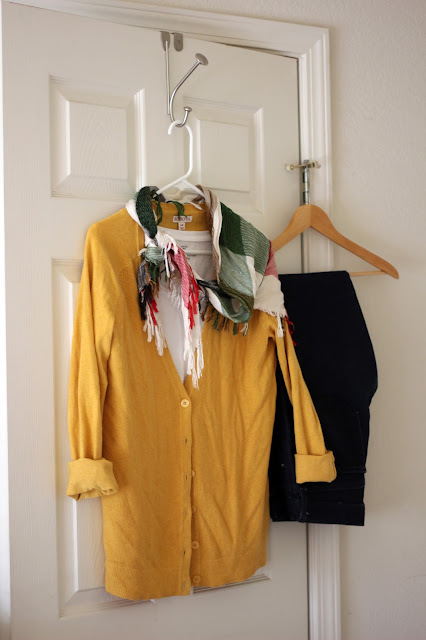 Throw on a contrasting colored scarf, some jeans and off you go. Errands to run? This one is a little more dressed up, for me anyway. I don't wear button down shirts very often, but I love this checkered one. The sleeves of the shirt I'll probably roll with the sleeves of the Cardigan, so there is a little pop of color mid-line. Ok, now we're getting dressy. I might wear this to church, or to a doctors appointment for one of the kids. It still says "comfortable", but dressed up a bit more. People will take you seriously in this and see that you put in some effort. See if they treat you differently when you wear a dress or skirt. I bet you'll notice a difference! And it's nice to feel feminine sometimes. This dress is polyester as well, so if I end up with snot, or vomit, or food on me it can be easily cleaned. Got to think practicality too, right? Pardon my blurry photo. For some reason my camera didn't want to focus on this set. Probably the lighting. Or it could have been the little one yanking on my arm while I was aiming! For this set I added some pops of color. Color can be scary, to start, especially if you've been wearing grey, black or neutral colors for the majority of your life like I did. My wardrobe consisted of black pants or jeans, and grey, black or neutral colored shirts. Blah. Blah blah blah. So start with one colored shirt. What's your favorite color? Buy one in that color. Wear it once. See how you feel. 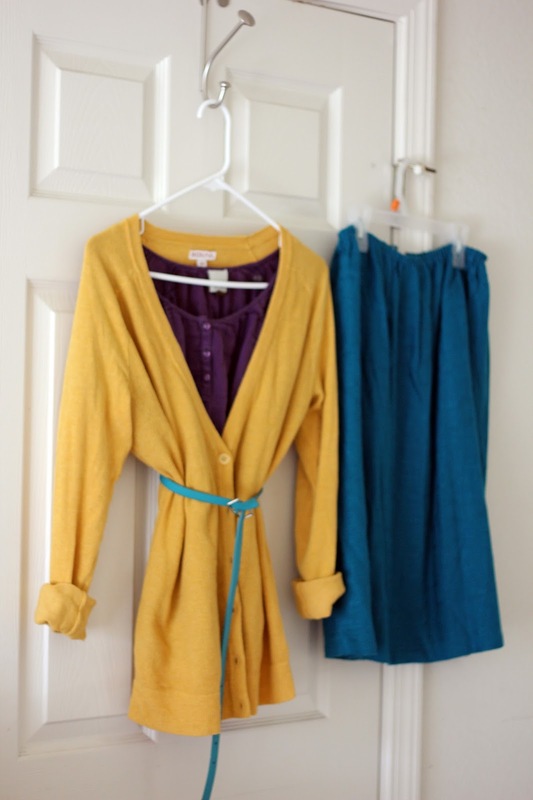 Next time, find a coordinating colored pair of pants or a skirt and put an outfit together. See how you feel. It will get less scary. And you'll start to feel good about yourself in that outfit. Fist bump, fellow mama. Here's to feeling better about you.